Alexander Gray Associates presented an exhibition of the conceptually parallel artistic practices of Gallery artists from diverse geographical and cultural contexts, featuring recent and historical works by Polly Apfelbaum, Luis Camnitzer, Melvin Edwards, Harmony Hammond, Lorraine O’Grady, Betty Parsons, Joan Semmel, Hassan Sharif, Valeska Soares and Sergei Eisenstein. Polly Apfelbaum’s artistic practice is distinguished by a hybridized aesthetic that fuses traditions of painting, craft, and installation. In her recent wall-based ceramics, she utilizes saturated color and abstract forms, and implies human presence through her use of peoples’ names as titles. These names point to a wide range of influences, including: music, film, literature, and mass media; philosophy and politics; art history and architecture. Occasionally, they refer to personal acquaintances and friends, underscoring the intimacy of there ceramic practice. Debuting at Expo Chicago is Luis Camnitzer’s Monopoly (2012–17), a modified board game that reveals the artist’s approach to art making as a platform for organizing and acquiring new information through the decontextualization of familiar tools and objects. His use of a board game is representative of his ongoing interest in both literal gameplay and the absurdity of political hierarchies and their influence on commercial culture. Camnitzer’s artwork explores subjects such as repression under systems of power, pedagogical norms, and the deconstruction of familiar frameworks. His humorous, biting, and often politically charged use of language as art medium has distinguished his practice for over four decades. Melvin Edwards’ welded steel assemblages reflect his engagement with the history of race, labor, violence, as well as with themes of African Diaspora. Distinguished by formal simplicity and powerful materiality, works like No Rem (2012) represent how Edwards manipulates and welds familiar forms, including: railroad spikes, hammer heads and other industrial objects that speak to personal and collective histories emphasizing the links between people, generations, and cultures. Harmony Hammond grommets a field of holes into the canvas in Red Stack (2015), an example of her recent “near-monochrome” paintings. She applies grommets and straps to the canvas, and layers oil paint to build a textured, earthy red, surface activated by light and cast shadow. The grommets are not aligned in a perfect grid, as the drying paint often warps the surface of the work. Hammond states, “I consciously allow–no encourage–process to alter the materials, and therefore, the grid.” The grommeted holes physically open the painting surface alluding to layers, spaces and histories buried below. In Art Is… (1983/2009), Lorraine O’Grady chronicles a joyful performance in Harlem’s African-American Day Parade in September 1983, blending ideas of gender and diaspora with personal and political identity. The selection of nine photographs on view depict various aspects of the performance, engaging with the audience, parade dancers, and even the New York Police Department. The full set consists of 40 prints, which are currently on view in the seminal exhibition Soul Of A Nation: Art In The Age Of Black Power 1963 - 1983 at Tate Modern, London. Since 1974, Joan Semmel has focused on her body as subject, beginning with her “Self-Images” series, in which she radically shifted the perspective of her compositions to capture an enhanced sense of intimacy. In her new work, she synthesizes conceptual and formal concerns echoing many of her previous investigations. In Cool Light (2016), Semmel depicts her view of her body as she gazes down at her legs, her left leg bent towards her chest. She utilizes naturalistic tones, and crops the composition tothe point that the forms of her body become a landscape. In his Semi-System drawings, Hassan Sharif used self-invented calculations and permutations to determine a variety of possibilities for the shape of an angular line. In Seven Points Angular Lines - Part 1 (2013), the artist selected, seemingly at random, one variation to depict as a sculptural element. At any point, the system is on the verge of unraveling, referencing the systematic but frenetic development of Modern Dubai, where the artist lived from 1984 until his death in 2016. Utilizing tools of minimalism and conceptualism, Valeska Soares’ work embraces emotion and humanity, mining territories of love, intimacy and desire; loss and longing; memory and language. In Soares’ refined visual language, reflective objects suggest reflective thinking, concealed images reveal unexpected mysteries, accumulated words disintegrate linear narrative. Her work Doubleface (Mars Yellow) (2017), a modified vintage oil painting, finds the intersection between painting and sculpture, and suggests the secretive allure and mystery triggered by covered objects. Sergei Eisenstein’s sexually explicit drawings, completed between 1931–1948, span the period of his travels in Mexico and the United States in the 1930s until his death in Moscow in 1948. A renowned film director and film montage innovator, Eisenstein also wrote extensively and made upwards of 5,000 drawings throughout his life, including designs for film sets and storyboards. This group, however, reveals Eisenstein’s sexual imagination, in part informed by his own bisexuality as well as his considerable reading and travel. The Gallery’s participation in the Override project includes Luis Camnitzer’s This Is a Mirror, You Are a Written Sentence, 1966–68, which the artist considers his first Conceptual piece. The project will display the two unpunctuated phrases run together, “This Is a Mirror You Are a Written Sentence,” on billboards throughout Chicago’s City Digital Network (CDN). Camnitzer’s statement is grammatically incomprehensible and lacks any logical construction. The artist welcomes the possibility of shifting the physical and mental placement of the viewer by means of a sentence, therefore underlining the gap between word and image. Ultimately, the relationship between language and object remains a spontaneous construct, a narrative assembled by the viewer. Expo Chicago, the International Exposition of Contemporary & Modern Art, opens the fall art season each September at historic Navy Pier. 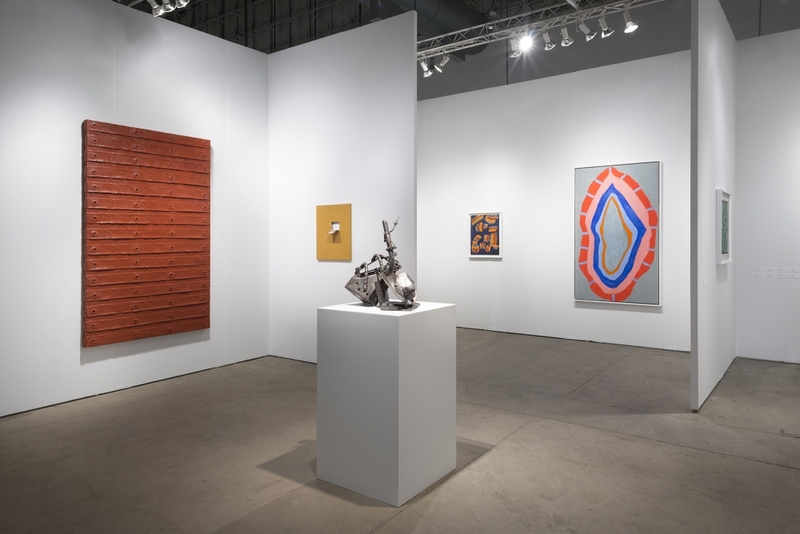 Expo Chicago presents artwork from 140 leading galleries from around the world, and includes Exposure—a section that affords younger galleries the opportunity to participate in a major international art fair. Exposure provides critical opportunities for curators, collectors, and art patrons to survey the best in innovative and emerging programs.